Top Sailor is a sailing, surfing and motorboat simulator for desktop (MacOS, Windows, Linux) and mobile devices (iOS, Android, bada, Windows Mobile, PalmOS). Take Top Sailor with you and learn basics of sailing! 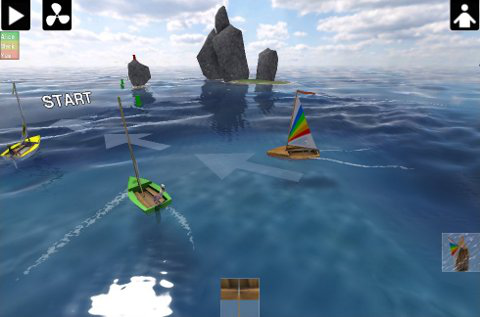 See how wind force affects the sail and test your skills against AI opponents in a yacht race. Learn how to trim the sails to make the most use of wind energy. Discover when there is a risk of capsizing. Practise sailing downwind and upwind, tacking and gybing. Improve navigation skills, sail race strategy and tactics. Stay updated. Click the image to subscribe to the Top Sailor news feed. Or visit our forum. The physics and realism are completely amazing. So much like real sailing! If you sail, you must get this. If you don't sail, you'll know how when you've got some Top Sailor races under your belt. May I suggest decreasing the seagulls volume... even still, this is excellent. Still learning but already see that this is just what I was looking for: a realistic sailing/boating game with natural sounds. Graphics are fantastic and it's lots of fun. One thing – the wind sound is a bit loud. Highly recommend! Hands down best dinghy racing simulation on any platform. Now even better since you actually have to look at sails to see if you are catching wind or not. Endless fun for the winter months! Wonderful game. I love the great physics and great controls and realism. I wish there were more levels, different ships to choose from, and an exploring mode. All together a great mobile game though. I'm no sailor but I love this game. I would expect it's as close to the real thing as you can get on a phone. You find yourself pushing to get the sail just right to make the best use of the wind. And when you through the AI opponents into the mix it gets very interesting! Contact us if you want a customized application (e.g. promoting some event) based on the Top Sailor simulation engine, or a logo/brand of your sailing school on the splash screen of Top Sailor.